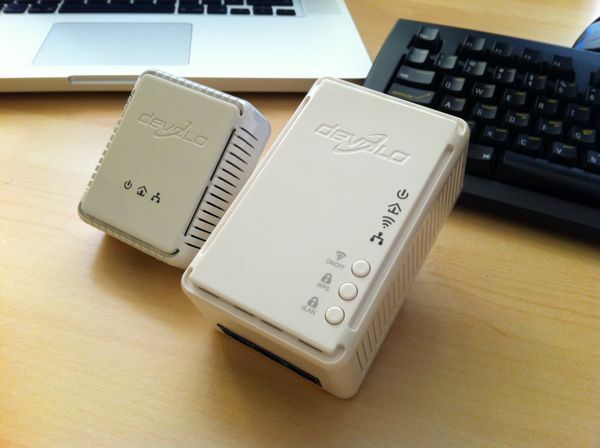 Since I last reviewed a Devolo product back in 2009, I have been using ethernet over power technology (often described as HomePlug) for a fast connection to my ADSL router. 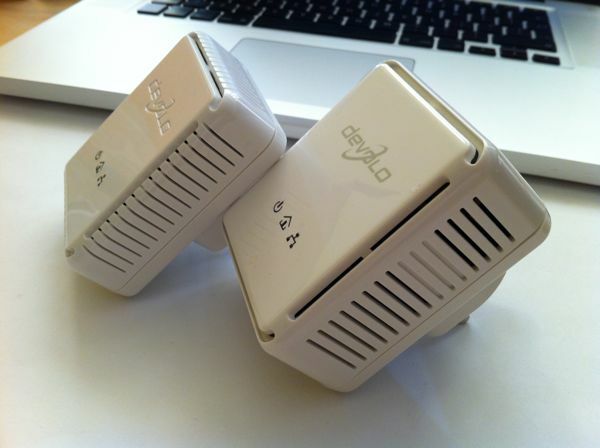 Tired of unreliable wireless coverage, I have been relying on Devolo’sde HomePlug products to keep me connected around the home. This review features the dLan 200 AV Wireless N Starter Kit which retails for around £118. HomePlug makes use of your home’s electrical wiring to transmit data between your electrical sockets – essentially transforming your home circuit into Ethernet cables. A simple setup would involve a HomePlug adapter to your broadband router and another to your computer. This creates an Ethernet connection between the two points which can reach speeds of up to 200Mbps. 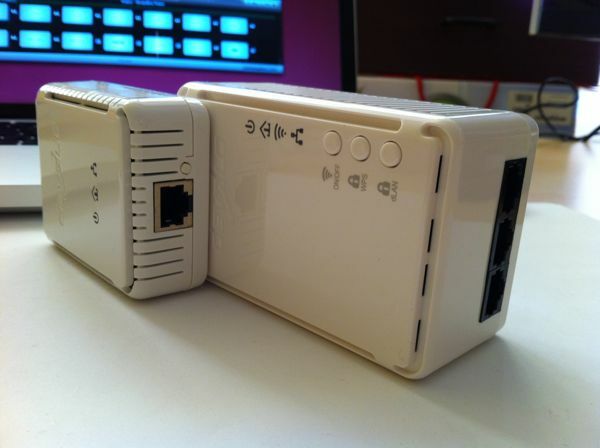 Devolo has continued to refine the technology over the last few years and has recently brought out the dLAN 200 AV Wireless N. This starter kit consists of two adapters – one with 3x Ethernet ports and integrated Wireless-N. It’s essentially a wireless router combined with HomePlug technology in the size of a power brick. The second adapter is a standard HomePlug adapter with a single Ethernet port – I used this in my testing to connect directly to my ADSL router. The HomePlug Wireless N adapter acts as an extender and 3-port Ethernet hub which can achieve up to 300Mbps using Wireless N and 200Mbps using HomePlug. Whilst these numbers sound great, testing did show varying results and it’s unlikely most people will reach these kinds of speeds in a real-world environment. Staying true to its word, Devolo have continued with its trend of simple setup. It takes just a few seconds to establish a connection between two HomePlug adapters. The wireless is pre-configured with an SSID key and once you’re connected you can configure it through the browser-based control panel. For enhanced security, data transmission over your power lines can be encrypted. This requires a bit more fiddling with the settings and jotting down the security keys, but it does offer peace of mind that if your electrical circuits are somehow shared or accessible by someone else, they won’t be able to listen in. Connection speeds using HomePlug does depend on the quality of your internal wiring. Tests allowed me to reach 22.3Mbps with a connection two rooms away. Using wireless with the HomePlug Wireless N adapter in the same room as my laptop, I was able to match the speeds of connecting over Ethernet to the adapter. When I moved downstairs, performance using HomePlug fluctuated between 17 – 22.6Mbps. I found that different wall sockets, despite being in the same room, seemed to offer different performance levels. One set of sockets maxed out at 19Mbps but another set was offering me 22.6Mbps. Connecting up in the same room as the router-connected HomePlug adapter achieved performance levels of 33.4Mbps. As you can see, performance levels aren’t anywhere near the theoretical maximums. At its average performance levels, it can just about keep up with a 20Mbps connection but it’s nowhere near what a direct connection achieves when you plug directly into the router – and even then I only get 74Mbps. The performance level of using HomePlug won’t meet your expectations if you’re going to be doing large file transfers. Backing up to a NAS drive for instance is painfully slow. A 4GB file transfer using HomePlug takes around 30 minutes, whereas a direct connection to the router takes around 10 minutes. Devolo has tried to push the HomePlug technology as a great way to stream media content around the home. I tested this theory with two 720p High Definition video streams in parallel and was pleased to see that it handled it without any problems. Devolo continues to innovate in the HomePlug space, but I think the technology has hit a speed wall due to the varying quality of home electrical wiring. I have no doubt that a modern home could achieve much higher speeds using HomePlug, but for most of us this isn’t a reality. Given the state of broadband connections in the UK, most of us don’t get anywhere near the levels of performance that are promised by our ISP’s so HomePlug is a suitable alternative to relying on a wireless connection. Faster response times and less lag are some of the key benefits of using HomePlug technology and with the Wireless N coverage provided by the adapter, you can share the benefits of HomePlug with other users/devices in the home.